Writing specialties, where the writer addresses a narrow niche or fixed focus, are interesting in several ways. Some copywriters do a single thing: write white papers for the oil industry, or technical documentation for telephony applications, or sales letters for Fortune 500 clients. Early in my writing career, I was employed by Kennan Ward, a photographer for whom I wrote the backs of his nature-oriented postcards and notecards. At first writing within the card’s restrictions seemed like a clumsy, scattered means of expressing information, but in time I developed a structure and flow for the short pieces that still afforded creativity, while delivering the mandated facts about the depicted scenes and animals. But the reason I’m writing about writing cubbyholes is because I wrote an obituary (with my sister Colleen’s help) yesterday for my father—and obituary writing is peculiar unto itself. It’s very necessary to deliver dates and numbers in an obituary: marriages, births, number of children, date of death, and a passel of facts as well: interests, significant jobs, milestones, avocations. But mixed in the orderly stone columns of a life’s spreadsheet, you must attest to the blooming flowers in a tangled field, a comical toy under a towel, a mysterious box that makes you wonder what’s inside, a whisper of pain, pleasure—something of that indefinable stuff that separates us from the insects. Today I’m taking a shot at writing a eulogy as well, for the rosary service. That writing should be easier, in that no mathematicians will tamper with the word count; my father was an eccentric character, and when telling stories, you don’t want to clamp down hard on the words. I want to write the eulogy, and want to do it well for my father, but I’m pretty sure I don’t want this death-based writing to become my specialty—it takes a bite out of you. Robert K. Bentley, beloved husband and cherished father, left this world for the next on New Year’s Day. Despite suffering from Alzheimer’s disease for the past 10 years, “Sarge” Bentley remained a cheerful, steady presence in his family home, up to the end showing the warmth and humor that characterized his life. His “glad you got to see me” always drew quizzical looks and then laughs from people who met him for the first time. Sarge was born on May 14, 1917, in Colorado Springs, Colorado. Despite living more than 60 years in Southern California, he maintained that Colorado had it over any spot in the world. He brought back a large glass jar from one of our annual summer trips, full of clean Colorado air, and every so often he would take it off the fireplace mantel and grab a whiff of it, careful to leave enough to savor another day. Quarterback of his high-school football team, he never admitted that he managed to break his knee on purpose during a big game to win the affections of concerned cheerleaders. 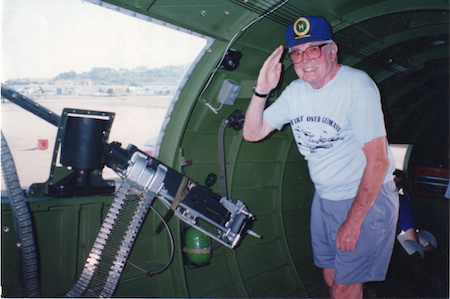 Sarge was a waist gunner on B-17s in WWII, flying 35 missions primarily over Germany. He listed every mission in a small, 3x6 inch leather-bound notebook. After WWII, he was drafted out of the Army reserves and served in the Korean War, spending much time in Japan. He earned the stripes and the nickname that stayed with him until the end of his days from those years in the service of his country. Sarge met his bride-to-be, Eileen O’Brien, while stationed in Long Beach, CA in 1945. She worked at the old Manning’s Restaurant on Pine Avenue, and when he came in to eat one day, she elbowed aside the other waitresses so she could carry the tray of that handsome man. They married on May 30, 1947. Sarge worked at the Ford Motor plants in Long Beach and Pico Rivera City for 39 years—and in those years, the number of days he missed work could be counted on one hand. That kind of steady, old-fashioned perseverance was a mark of his character, a character defined by consistent warmth and fellowship. After his retirement, he became a congenial nuisance around the house, golfing occasionally, and traveling to Alaska, Ireland and Las Vegas, where he was a good friend of the casino craps tables, occasionally winning but sometimes not, so the drive back to Long Beach could seem awfully long. He was known in the neighborhood for his warm welcomes and his zany front-yard signs, boosting his Colorado sports teams, especially the Denver Broncos, and commenting on the times. He is survived by his wife Eileen, his four children, Colleen Bentley, Kathleen Bentley, Rick Bentley and Tom Bentley, his grandson Zach King and several nieces and nephews and grandnieces and nephews. Despite him living a full, rich 93 years, they wish he could have lived forever. I wanted it to say more. Not more words, but more essence—but that’s the challenge, always the crucible of trying to write. This obit is what we have, and this will do. Dad, I hope you like it. This entry was posted in copywriting, family, life writing, obituary writing, storytelling. Bookmark the permalink. Thanks Dorothy. Of course, now we’re talking about the juicy stuff we forgot and left out, but it is what it is, and that’s fine. It does give a flavor of what my dad was all about. He probably wants more press, though. Great job Tom. I’m sure he’s very proud of the end result. Mr. W.! A pleasure to see you here. Thank you for settlin’ in for a spell (and for giving a wave to my dad). Tom, I am sorry to hear of your dad’s passing. Your dad can stand proud with such a rememberance from his son. Brillantemente. Well done Tom. As a reporter who has written many an obit and the eulogy, I know what it costs – monetarily and emotionally. I think your hometown paper would welcome an essay on the loss and the memories for Father’s Day, so write it now and send it on later, when the time and the pain surfaces again – as it always seems to do for many of us at that time. He will not be forgotten. And it will be free. Include photos. Papers love old photos. They love good writing. They love a chance to smile when many whose fathers who have also passed – have the opportunity to recall the happiness, the silliness, the blooming flowers and the memories. When you write it there will come a place to print it. What is important is that you capture the ephemeral while it still caresses your heart. The song of our pain fades and it’s hard to recapture the words of the chorus later. Write it now anyway. Dollars and retirement funds and your first born in exchange for an obit be damned! Then post the obit you wished you could have printed here on your site. More of us will read it here anyway. Hugs to you!! Becky, that’s a nice idea on writing a piece for Father’s Day. I can’t do it now, because my thoughts about him are too raw—I want to calm a bit. But you are right about the “song of pain” fading, and undoubtedly circumventing the full expression of writerly grief. Thank you for the insight. That was a beautiful eulogy. It made me smile and laugh and feel touched. In some way I got to know your father through those words. Jai, thank you. If I’m able to convey any bit of what was essential about his character, I’m happy. He could be an elusive man to me as well, but I know from his actions that there was basic goodness in his life, and he shared that.